Don “Mac” McCoy was the longtime superintendent of Las Vegas Municipal Golf Course, and was responsible for co-designing and building the 9-hole addition of the 18-hole course. With his induction, McCoy became the first superintendent to be recognized by the Las Vegas Golf Hall of Fame for the prestigious honor. 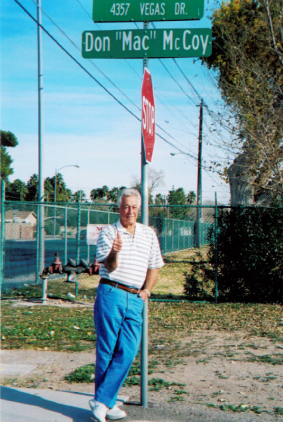 In 1950 he landed in the Parks Department at the City of Las Vegas and in 1952 became the superintendent of the Municipal Golf Course at Vegas Drive and Decatur. The job came with a salary and a place to live for his young family … the former clubhouse of the original nine holes built in 1939. It was and is the only residential home located on the golf course, between the 14th and 15th holes. Although now vacant, the house still stands today and if you look closely you can see the cleat marks imbedded on the living and dining room floors. An addition was added in 1958 at the request of City Commissioner Ed Fountain. Besides caring for the course, McCoy co-designed and oversaw the build of the new nine holes off Washington Avenue. A significant amount of planning went into the design. Irrigation was fed by multiple wells which fed into an earthen reservoir. Additionally, the caliche beds were so predominant that dynamite was used to blast holes for 100s of elm trees placed onto the property. Mac still has home movies he filmed during the construction. With a few exceptions such as the addition of palm and mulberry trees in the 1970s and a major redesign of the par 3 third hole in the 1980s, the original track remains mostly the same as laid out by Mac and his crew.